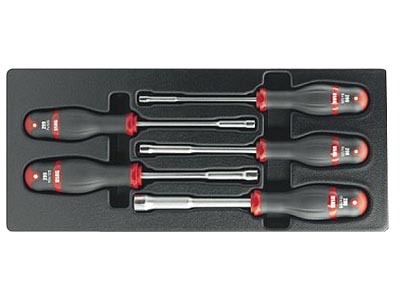 USAG 299 Series Metric Nut Driver Module Set (5pc)(519/299) - these are the same as Facom's 74A series (with Protwist handles) in a convenient 5pc module set. Sizes include 6,7,8,10,13mm. The durable soft polyurethane handle of the 299 range of nut spinners is abrasion and corrosion-resistant. It offers excellent grip and provides the technician with maximum torque and feel during use, while the polyamide core resists shock, greatly reducing user fatigue.